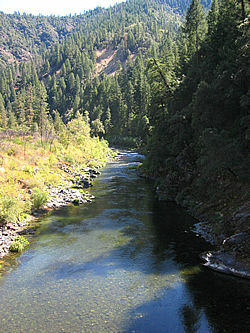 The Upper Sacramento River has been a contradiction to me. On one hand, it features some of the most beautiful runs and pools anywhere in Northern California. On the other hand, it is bordered, and sometimes surrounded, by a major interstate highway and a busy train track. Often I can spend the entire day on the river without seeing another angler, yet trains are constantly screeching around the bends and 18-wheel trucks are compression braking down the steep and windy I5 corridor above my head. It all seems so hectic and industrial that I often wonder if truckers or train engineers ever stop to fish. It's no wonder that many of us blow right through Dunsmuir, on our way to more "secluded" waters such as the McCloud or Hat Creek. 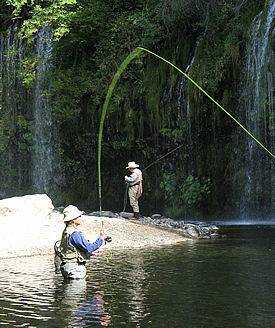 Ironically, because the Upper Sac offers almost 40 miles of easy-to-access river, you are probably less likely to bump into another fly fisher there than, say, the Power House 2 riffle or Ah Di Nah, particularly if you are willing to move a bit. My personal goal, which will probably never be realized, is to at least walk every mile of the river. This was the setting for a less traditional PFF fishout. 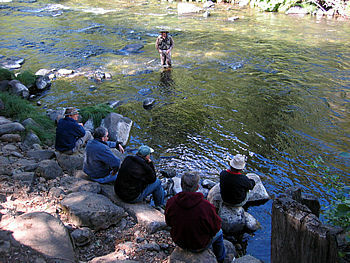 Instead of a mass flogging of water, Ron Hart spent a leisurely Saturday morning teaching us the finer art of nymphing. One nice aspect of this type of clinic is that it does not have a traditional guide/client relationship. Ron did not feel compelled to get us "into fish" and in fact, none of us even had waders or rods. Rather, he patiently and methodically went through all the techniques that he recommends for successful nymphing while we watched and learned from streamside perches. 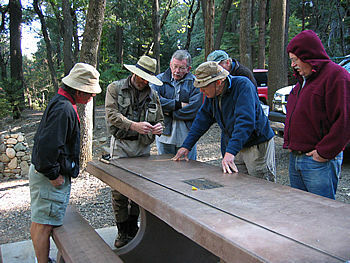 The participants included Mike McGuire, Wayne Kuramoto, Roger Finke, Ed Kamholz, Jon Parkes, and the author. The presence of Ed and Jon was a pleasant surprise, since I know they're long-time club members, but somehow I have never met them in person before. Such is the magic of a fishout. Thomas Rauer and his mom had planned to attend, but a broken arm (no, not his casting arm) lead to their last minute cancellation. We met at the Dunsmuir City Park - why it is called the "City Park" has always puzzled me - and Ron started with a quick overview of rigging. Afterwards we trooped down to the water where he proceeded through the basics of nymphing. 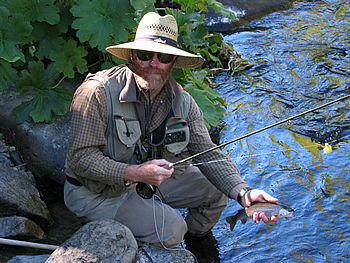 The water at the park is a great place for an on stream class because it features convenient pools, riffles, and runs that Ron could use to demonstrate different techniques. Of course, the lesson is even more credible when the instructor is catching fish. He managed to nail four fish during his lesson, a sure indicator that something is going right. To me the most useful skills he taught were proper hook-setting technique and roll casting with an indicator. He also taught us a neat trick with split shot, which Mike wrote up this month for the tackle section. The park was getting quite busy by the end of the lesson - the third Saturday of every September is "Coastal Cleanup Day" which has become a general "Waterway Cleanup Day" throughout California. The Upper Sacramento River Exchange was using the park as the staging area for their Upper Sac cleanup, and there were hoards of volunteers flocking in to help. Of course, although the scenery takes center stage, there are fish in there too. I hauled out six with my own rod, and one more (accidentally) while helping Wayne correct his drift. As the day wore on, people moved up and down the river. 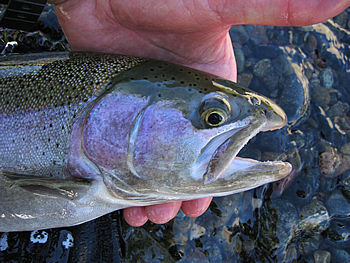 Except for other PFFers, I only saw two other fly fishers on the section of the river above Mossbrae. Around dusk, Mike and I regrouped and headed back to the motel - those family band radios can be very handy in these situations. Mike and I wandered over to Caf� Maddalena in Dunsmuir for dinner and, not surprisingly, discovered Ed and Roger sitting there enjoying their meal. It is one of life's axioms that a day of fly-fishing makes the evening meal taste much better - particularly if it is accompanied by a drink or two. Sunday Mike and I spent nymphing some of our favorite sections on the lower portion of the Upper Sac. My experience is that as you move further downstream, you trade numbers for size. Sunday was no exception. We caught far fewer fish but some of them were monsters. There is one pool that I like because it has always been good to me. The head of the pool features a plunge that extends all the way across the river, producing numerous braids of fast bubbly water. 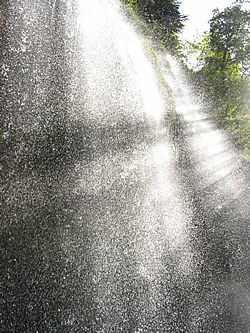 In my mind's eye, I picture trout under each of the braids looking up for yummy stuff dropping into the pool. My imagination can't be that far off because the pool produced three rainbows, the largest taped out at 22 inches in my measure net. Of course, Mike and I couldn't simply jump in the car and head home without first checking out the Lower Sac. Caldwell Park was unfishable but we managed to fish for a while at Girvan. Surprisingly, there were five other anglers there, but nobody seemed to be catching. Perhaps we need a Lower Sac clinic next.